The ISACS WINE NOTES app that was developed by gourmet and wine expert, John H. Isacs and the ISACS Guide Team, allows wine lovers to record notes on their favorite wines and also share their wine experiences with online friends. The app features information and tools to embellish the user’s wine knowledge and overall experience through fun and educational wine tests, making wine friends functions and informative wine celebrities’ columns. 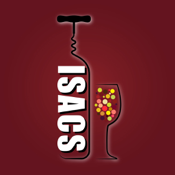 ISACS WINE NOTES app provides interesting and stimulating content and social connectivity that will enhance the wine experiences and lifestyles of both wine beginners and experts alike!